We arrived in Monaco after a pleasant night’s sail from Livorno. After breakfast, we departed the ship and hiked up the hill to Monaco-Ville. Rick Steves suggests taking a bus up the hill, but we found it a pleasant hike with great views of the Port of Monaco. At the top of the hill, we strolled amongst colorful gardens while winding our way around to the cathedral of Monaco, as well as the royal palace (sadly the State Apartments are closed this time of year). In the distance, we had seen bad weather approaching, and it started raining by the time we were ready to leave the palace. Fortunately, we’d anticipated wet weather and brought our rain gear. 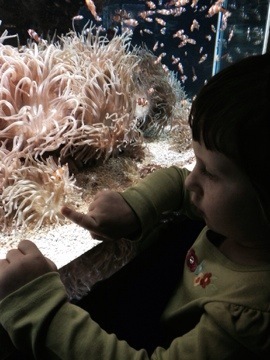 Our next planned stop was the indoor Oceanographic Museum (which is really part museum and part aquarium). We spent a couple of hours exploring this facility, which is housed in a marvelous structure. I probably wouldn’t recommend it to folks without kids (unless you love natural history / marine life), but it’s a “must do” with kids. After the museum, we found a little cafe and had a light lunch. Libby enjoyed a traditional ham and cheese sandwich, and Mom and I had Nutella crepes (yum!). Emerson ate a cheese pizza. After lunch, we caught a bus down to the port (mostly to avoid the rain), and we returned to the ship around 2pm. This gave me time to get caught up on email and make a few calls via Skype. Had the weather been better, we would have stayed out much longer in Monaco, as it’s a great place to visit. 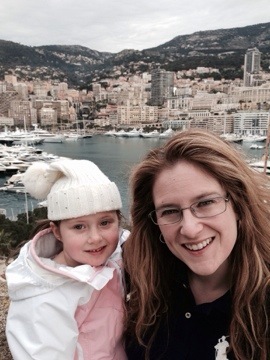 Libby’s parent took an afternoon driving tour of Monaco, Nice, and points in between, which they also enjoyed. We ate dinner in the Grand Pacific Dining Room. It’s been a number of cruises since we tried dinner in one of NCL’s main dining rooms, and we were thoroughly unimpressed by both the service and good quality. I don’t think we’ll be back again this cruise. I’d rather pay a little more and enjoy ourselves more thoroughly — I just view paying for specialty restaurants as “deferred cruise fare” (especially since NCL is usually lower-priced than many other lines for comparable cruises). Speaking of other lackluster things, we saw a performance of “Shout” last night in the theatre. Emerson seemed to enjoy it well enough (though some of the content wasn’t really suitable for her age). In contrast, Libby and I hated it. In fact, I think it was the worst performance I’ve ever seen on a cruise ship. It was uninspired: the cast lacked talent and/or enthusiasm, the song selections were mostly lackluster, and it lacked a compelling plot. The members of the audience kept coming and going too, which pissed me off and distracted from a show that was already struggling to keep my attention. All in all: epic failure! Oh well, at least Monaco was great, which is what matters. Today’s box score: +1 country (Monaco).